He's just grabbing IP addresses off of the server list, there isn't anything impressive going on with that. However, it also sounds like he's ddosing servers as well. He literally ddosed my brother's comp, i don't know why. opi has a japanese "girlfriend". honestly i don't know why the forget ip stressers even exist in the first place. like how can anyone in good faith develop and host a tool that lets you hinder the quality of someone else's paid internet? Sounds like a right knob. Needs his key revoked. I honestly can't understand how sad you have to be to boot someone offline just because you're "bored" or "don't like them". 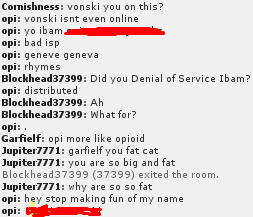 He DDoSed my brother for no reason, he had nothing to do with it. Only retards attack innocent people.